Chief Minister, Shri Virbhadra Singh and Smt. 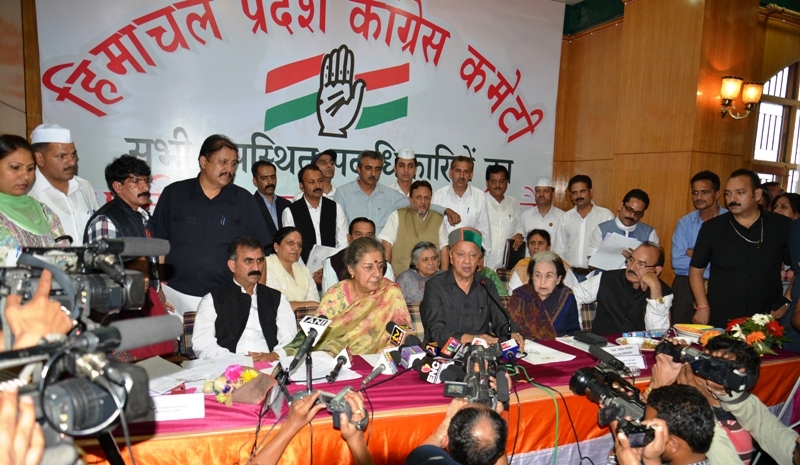 Ambika Soni , AICC General Secretary and Incharge Himachal Congress addressing the Press Conference at Shimla today. Chief Minister Virbhadra Singh said that National Food Security Ordinance (NFSO) was a major step to ensure Food Security to the people of the country. Chief Minister was speaking at the second General House Meeting of Himachal Pradesh Congress Committee at Rajiv Bhawan here today. Virbhadra Singh said that Himachal Pradesh was the first State in the country who started subsidized ration in the State during his last tenure. He said that subsidized wheat flour, rice, three pulses, two litre edible oil and one kg. iodized salt per month were being provided to all the ration card holders in the State. He said that State Government would not only provide subsidized ration to BPL families but this facility would also be continued to APL families. Chief Minister said that the motto of present Congress Government is ‘Vikas, Vikas Aur Sampooran Vikas’ that was the reason people have full faith and confidence on the Government. He said that all round development was being ensured in the State without any discrimination. He said that all Chief Ministers of Congress Governments right from first Chief Minister Dr. Y.S. Parmar have given preference to the balanced development of the State. Virbhadra Singh said that blood donation camps would be organised at State, district and block level on the birth anniversary of former Prime Minister Shri Rajiv Gandhi on 20th August. He said that he had been in the politics for over 50 years and had opportunity to work with veteran Congress leaders of the country. He said that Congress candidate from Mandi parliamentary seat had won the bye-election by a huge margin and the credit goes to the coordinated efforts of all Congress workers and above all people of the constituency. He urged the Congress Workers to remain united and work wholehearted to ensure victory of congress candidates in the ensuing Lok Sabha elections. Earlier, Shri Virbhadra Singh welcomed the AICC General Secretary and Incharge of Himachal Pradesh Congress Party Smt. Ambika Soni. He said that this was the second time when She was appointed incharge of the State and hoped that all party workers would benefit by her vast experience and guidance as she had rich knowledge of whole Himachal Pradesh. He also welcomed Secretary, AICC and Co-Incharge Smt. Geetashree Oraon. Chief Minister honoured them by presenting Himachali caps and shawls. AICC General Secretary and Incharge of Himachal Pradesh Congress Party Smt. Ambika Soni urged the partymen to fan out in the fields to tell common man about the benefits of the NFSO and dispel the false propaganda of the Opposition. She said that UPA Government under the guidance of UPA Chairperson Smt. Sonia Gandhi and Prime Minister Dr. Manmohan had launched various welfare schemes for the benefit of the people of the country especially vulnerable sections of the society. She said that MNREGA, RTE, RTI and now NFSO were started by the UPA Government to empower the common-man. Smt. Soni said that Himachal Pradesh was making rapid strides in development under the able leadership of Chief Minister Shri Virbhadra Singh who had become Chief Minister of the State for sixth time. She said that Congress Party was committed towards upkeeping the high principles of democratic set up. She exhorted the congress workers to work unitedly for ensuring victory of all four Congress candidates from Himachal Pradesh in 2014 Lok Sabha elections. AICC Secretary and Co-incharge of Himachal Congress Party Smt. Geetashree Oraon lauded the Chief Minister Shri Virbhadra Singh for starting subsidized ration scheme in the State during its previous tenure. She said that Congress Party had always safeguarded the interests of the people especially poor and down trodden. She urged the party workers to apprise the people about flagship programmes of the UPA Government at grass root level. Himachal Pradesh Congress Committee President Shri Sukhvinder Singh Thakur said that under the dynamic leadership of AICC President Smt. Sonia Gandhi all the Congress leaders and workers of the State would strive hard to realize the vision and dreams of Smt. Sonia Gandhi to make India strong, united and growing in all fields and maintaining the dignity of all religions. He said that Pradesh Congress would immensely benefit from the rich experiences of Smt. Ambika Soni and Chief Minister Shri Virbhadra Singh and other senior leaders. He said that all decisions and programmes of Congress party would be implemented in letter and spirit in the State. Irrigation and Public Health Minister Smt. Vidya Stokes, Health and Family Welfare Minister Shri Kaul Singh Thakur, MLA Shri Kuldeep Kumar, General Secretary HPCC Shri Harwardhan Chauhan, Chairman, State level Planning Development and 20 Point Programme Committee Shri Ram Lal Thakur, Chairman, Pollution Control Board Shri Kuldeep Singh Pathania, District and Block Congress Presidents also spoke on the occasion. Council of Ministers, Chief Parliamentary Secretaries, Chairmen and Vice Chairmen of various Boards and Corporations, MLAs, former MLAs, District and Block Congress Presidents, Presidents of all frontal organizations of Congress Party, members and office bearers of the party were present on the occasion.